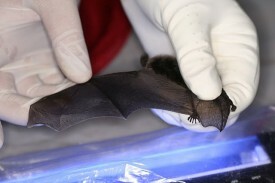 Share the post "Rutgers Scientists Awarded More Than $300,000 For Bat Disease Research By U.S. Fish and Wildlife Service"
Brooke Maslo banding little brown bats at a maternity colony to examine their survival in the years following the outbreak of White-nose Syndrome. Photo credit: Mick Valent. Three Rutgers researchers, assistant professor and extension specialist in wildlife ecology Brooke Maslo, molecular ecologist and assistant professor Malin Pinsky, and epidemiologist and associate professor Nina Fefferman at the School of Environmental and Biological Sciences, received funding of more than $300,000 dollars from the U.S. Fish and Wildlife Service to investigate strategies to fight White-nose Syndrome, a fungal disease in bats. “We are thrilled to be among the recipients of federal funding to advance our understanding of White-nose Syndrome, which is threatening U.S. bat populations,” Maslo said. Maslo, along with fellow Department of Ecology, Evolution and Natural Resources faculty members Pinsky and Fefferman, were awarded over $292,000 for the project, “Are bat populations infected with White-nose Syndrome undergoing rapid natural selection?,” which examines the evolutionary potential for bats infected with White-nose Syndrome to tolerate the disease. The award to the Rutgers scientists is part of a new round of funding worth $2.5 million for research, management and communications projects recently announced by the federal agency in an international and wide-ranging strategy to combat White-nose Syndrome. Maslo won a second award of more than $21,000 for a demographic analysis of a federally listed bat, in a project titled, “Annual survival of Indiana bats after White-nose Syndrome and its implications for population recovery.” In this project, Maslo will work in partnership with Chris Sanders of Sanders Environmental, Inc., a firm specializing in environmental surveys and solutions for issues that deal with bats and birds. According to the U.S. Fish and Wildlife Service, its new investments will further the effort to stop the spread of this deadly fungal disease that has killed millions of North American bats, which are critical to the economy and environment, since it was first documented in New York in 2007. “Bats play an important role in maintaining human quality of life and food security, and continued support of research on bats and bat conservation can help to ensure that they continue to persist despite the many threats they face,” said Maslo. Biologists working with bats. Courtesy of U.S. Fish and Wildlife Service. In the past eight years, bat researchers like Maslo and her colleagues have made great strides in addressing the disease. 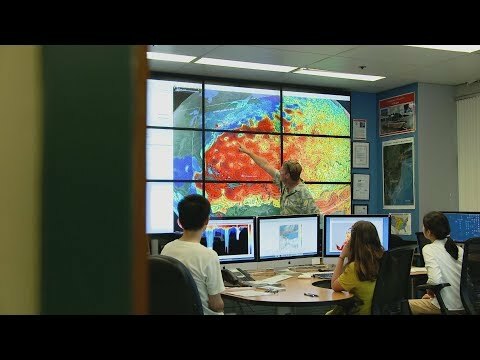 “Previous research funded by the U.S. Fish and Wildlife Service has led to major breakthroughs in our understanding of White-nose Syndrome, providing a measure of hope that we can defeat this devastating disease,” said Dan Ashe, director of the U.S. Fish and Wildlife Service. “Bats are a critical part of our ecology and provide essential pest control for our farmers, foresters and city residents, limiting the need to spray harmful pesticides. As the disease continues its spread into new areas, it is more critical than ever that we continue our strong support for solid science to inform wise decisions about our natural resources,” explained Ashe. 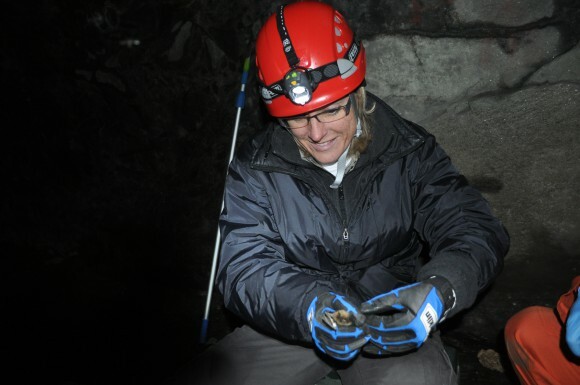 “The work we do here at Rutgers will significantly contribute to the growing body of knowledge regarding White-nose Syndrome and may prove to be critical in developing effective conservation strategies,” added Maslo. Since 2008, the service has granted more than $24 million to institutions, as well as federal and state agencies for White-nose Syndrome research and response. Funding for the grants was provided through the service’s Endangered Species Recovery and Science Applications programs.